One of the projects that I’m working on this summer is developing teaching resources for a set of math apps developed by The Center for Algebraic Thinking. 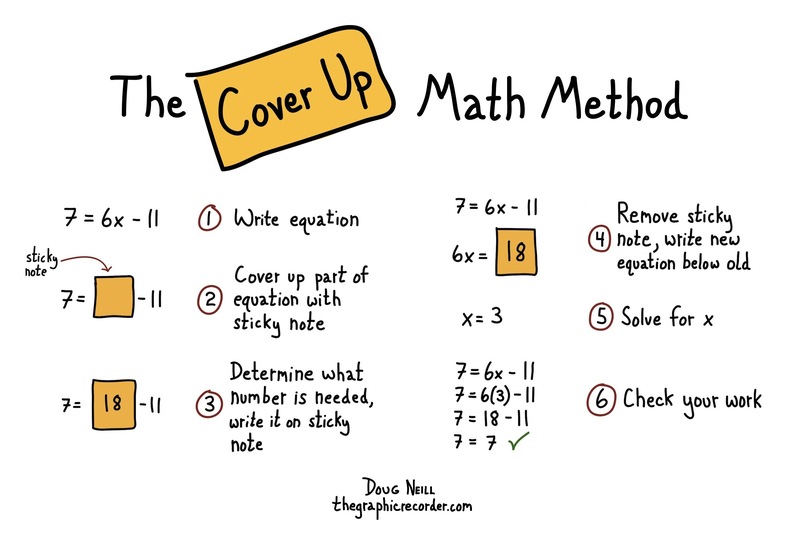 One of those apps, called Cover Up, taught me an approach to solving math problems that I hadn’t used before but found useful. I have outlined the method in the sketch above. What I like about this cover up method is that in addition to focusing you in on a particular aspect of a problem, it forces you to solve problems in a more intuitive way. Rather than resorting to a rote application of algorithms, you think more along the lines of “What number do I have to subtract 11 from in order to end up with 7?” I feel that approach is closer to the reality of the problem than the approach that says, “I want to get x by itself so I have to move that 11 to the other side of the equation.” The latter focuses your attention on the abstract representation of the problem whereas the former keeps you more closely tied to the problem itself. The developers of the app do a great job of explaining the philosophy behind this approach in the overview section of the app. I encourage you to check out the app if you have an iPad – it’s free!